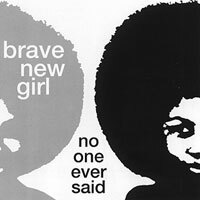 New York's Brave New Girl expand and extend their musicianship and abilities on their latest, NO ONE EVER SAID. Whereas in the past they relied on their combination of samba, ska, and soul, this time around they further those sounds with pop, R&B, and even more soul, to dish out an album that would fit in perfectly with the Motown sounds of the past. "One of these Days" is a pop-driven, slightly funk groove that smiles with warmth and happiness. The captivating female vocals will have you eating out of the band's hand, while the band (especially the horns) shoot straight to your soul and hit you with plenty of rhythm and blues to make you blush. "Eighth Street" is the should-have-been Motown hit. Keeping you dancing with the guitar's upbeat and plenty of ska rhythms, the band muscles up the sound with sparkling Motown grooves that are not-to-be-missed. "Brave New Girl" is a lounge jazz song propelled by heavy amounts of soul and R&B. The beautiful female vocals have no problem gaining your ear, while the rhythm section dishes out the moves. "No One Ever Said Goodbye" is another soul/R&B cut that will warm you up and keep a smile on your face well after the music has ended. If you thought their previous album was good, you haven't heard anything yet. And, if you haven't heard their previous EP, jump right in with NO ONE EVER SAID and you'll see why this band is all you need to dance and enjoy the night (or day, for that matter). I'll give it an A-. Brave New Girl, NYC: Brave New Girl, NYC Brazen: Brazen 7"